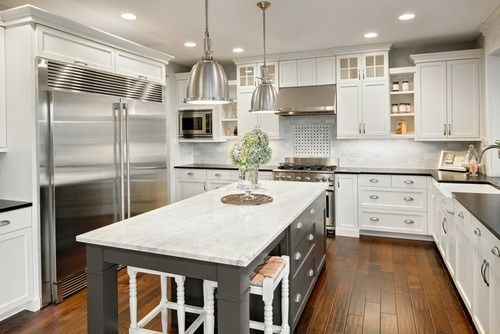 The look of your kitchen cabinets helps set the stage for the rest of the room’s style and appearance. Whether you choose a painted finish or a stain, your cabinets are meant to last for decades without an update. Both finishes have a lot of positive attributes, which can make the decision difficult. We will outline the differences between them below so that you can make a more informed decision. Paint is a solid, opaque, and smooth surface finish that can be glossy, satin, or matte in finish. It comes in a rainbow of colors and applies easily to hardwood, plywood 1, and medium-density fiberboard (MDF) cabinet doors and end panels. When using paint, you won’t see any of the grain, character, or movement of the wood below, which means that you could use a less expensive wood species and disguise it using the paint. Stain is a translucent finish that adds some color to the wood, but allows its natural grain and beauty to show through. Stains come in more limited colors, usually meant to amplify the natural color of the wood, so you’re more likely to find golds, reds, and browns, with some companies offering a limited run of blue, grey, or green stains as well. Stain applies best to wood, because it is absorbed into the wood; it would simply sit on top of MDF and without grain to enhance, it wouldn’t be as beautiful a finish on this type of surface. Stain can be used to enhance the natural color of wood, such as natural cherry; it will bring out the grain and still allow the color to deepen naturally when exposed to sunlight and humidity, while protecting the surface of the wood. If you’re purchasing new cabinets, the paint or stain is factory applied to the cabinets before they arrive at your home. This is also the case of cabinet refinishing; the new doors and drawer fronts will have a factory applied finish, while the stiles and ends of the cabinets will be given a new veneer 2 that has also been finished at the factory. If you want to give your cabinets an entirely new look, however, both applications will require you to strip the current finish off the cabinets for the best look. While it is possible to use some types of paint, such as Chalk Paint, over an existing stain or paint, all stain should be applied to clean, bare wood for best results, and most latex paints will require the same. Therefore, except with the application of Chalk Paint, the installation or application of the finish will be the same. With all other things being equal - the wood species, size of cabinet, and style of cabinet - painted finishes tend to cost about 15% more than stained cabinets. This is due to the application process necessary to get the smooth look of paint with no grain showing through. Therefore, the cabinets for a 10ft by 10ft kitchen with a plain door and stained finish on maple would cost about $5,950, while the same cabinets with a bright white paint finish on maple would cost about $7,000. For both painted and stained cabinets, the maintenance is fairly easy; wipe the surface with a soft cloth to remove most debris and dust, and use a wood friendly cleaner for more stubborn stains. Stained cabinets can be washed with soap and water, while painted cabinets should not be washed with water unless the paint used is considered “washable”, otherwise you could damage the finish. However, if the surface of the cabinet becomes chipped or marked, and you need to touch up the finish, you will find that stains blend better with the existing finish, particularly if the cabinet has a lot of grain to it. Paint is often created in dye lots that can vary from can to can, which means that in order to touch up a small area, you will need to repaint the entire cabinet. Depending on the color of your cabinets, you may find that dust stands out more than on other finishes. Light, painted finishes tend to disguise dust as the light-colored particles blend in with the finish. Dark-colored finishes - both paint and stain - tend to show dust more easily, which may mean that you need to clean them more often. Paint may crack over time, which can result in flaking of the finish. Stain tends to hold up better long-term than paint, because it is absorbed into the surface of the wood. Wood will expand and contract with humidity; paint can’t move with the wood, so it is more likely to split and crack on seams and joints. Stain does move with the wood, and therefore will not show the same damage or cracking over time as paint does. How much does it cost to install painted or stained cabinets in my city? Cost to install painted or stained cabinets varies greatly by region (and even by zip code). To get free estimates from local contractors, please indicate yours.